Zion Market Research has published a new report titled “Enterprise Spam Filter Market by Deployment Mode (Cloud-Based and On-Premises), by Organizational Size (Small and Medium Enterprises and Large Enterprises), and by End-User (Information Technology and Telecommunication, Education, Government, BFSI, Healthcare, and Others): Global Industry Perspective, Comprehensive Analysis, and Forecast, 2018-2026”. 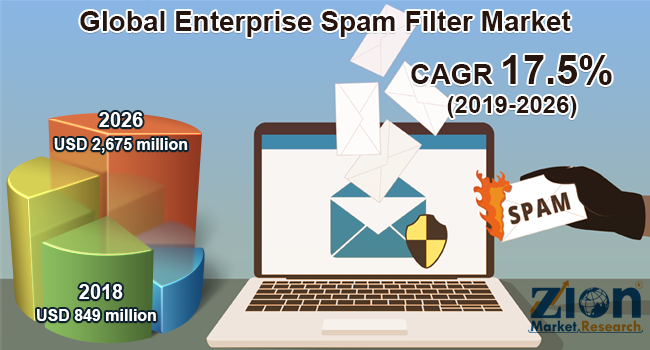 According to the report, the global enterprise spam filter market was valued approximately USD 849 million in 2018 and is expected to generate around USD 2,675 million by 2026, at a CAGR of around 17.5% between 2019 and 2026. Spam filters have security protocols that are required to identify and isolate the spams. Effective spam filters play a significant role in maintaining clean and spam-free inboxes. Spam filters within enterprises are used for security that uses multi-layered safety mechanisms and algorithms for separating the emails recognized as spam or the ones being suspected to be linked to a malware website. The increasing number of cyber threats and social spam is likely to drive the enterprise spam filter market globally in the future. Email security has been undergoing a revolution due to centralization and commoditization. Social spam refers to spams directed specifically at users of social networking services, such as Facebook, Google+, Pinterest, MySpace, LinkedIn, etc. Due to the growing number of social spams, spam filters have gained significance over the past few years. For instance, it is estimated that approximately 40% of social network accounts are used for spamming. Therefore, an enterprise spam filter with virus protection and real-time spam is the most suitable solution to block unsafe and unwanted emails. However, the lack of acceptance and awareness among enterprises may hamper the enterprise spam filter market in the years ahead. By deployment mode, the enterprise spam filter market is segmented into cloud-based and on-premises. The on-premises segment held the major market share in 2018 and is expected to dominate globally in the upcoming years. The on-premises segment has various features, such as high control security around solution, filters internal emails and stored messages, and functionality to license antivirus or anti-spam. The cloud-based segment is projected to be the fastest growing segment due to its accessibility and economical cost. By organizational size, the market is segmented into small and medium enterprises (SMEs) and large enterprises. Large enterprises held the major market share in 2018 and are expected to dominate globally in the upcoming years. This can be attributed to the availability of capital for maintaining the IT infrastructure and confidentiality of clients or employees. Moreover, these companies focus on providing spam-free emails to employees for ensuring optimum output without any disturbances. The small and medium-sized enterprises segment is likely emerging as the fastest growing segment in the upcoming years. By end-user, the market is classified into information technology and telecommunication, education, government, BFSI, healthcare, and others. BFSI segment is anticipated to dominate the market globally in the future, owing to the presence of huge amounts of confidential data and the information related to the money transactions. The spam filters are majorly used in the BSFI sector to avoid spam emails and detect unwanted and unsolicited emails as protection against any phishing attacks. Moreover, spam filters protect the mail server from DOS attacks. By region, North America held the largest share of the global enterprise spam filter market in 2018 and is anticipated to dominate in the upcoming years as well. Advanced technology and major innovations are likely to drive this regional market over the estimated timeframe. The U.S. held the major share in this regional market and is expected to dominate in the future. Moreover, the presence of major players in the region is also anticipated to support the North American enterprise spam filter market. The enterprise spam filter market in the Asia Pacific is likely to grow remarkably in the future. Some major players of the global enterprise spam filter market are Actopia Communications Ltd., Barracuda Networks, Inc., Comodo Group, Inc., CudaMail Spam Filtering, Firetrust Ltd., Greenview Data, Inc., Hornetsecurity, MailCleaner, Mimecast Services Ltd., MX Guarddog, Our IT Department Ltd., OzHosting.com Pty Ltd., Proofpoint, Server Cake India, SolarWinds MSP, SPAMfighter, SpamHero, Symantec Corporation, and TitanHQ.